"To everything, Turn, Turn, Turn, there is a season, Turn Turn Turn. We always have change in our lives and we are sad to see friends go, but sometimes there are nice surprises in store..."
With a combination of feelings, we say goodbye to another of our girls. We congratulate Sarah on her graduation from UNR and on receiving her degree in criminal justice. She is looking forward to a career in her field. We will miss her here at Southgate Coins. She joined our company in January 2004, a few months after moving to Reno from Ohio. Two and a half years later, and now it is time for her to go. We said good bye to Somer in December 2005, when she graduated. Kelly had to leave us because of an illness in her family; another good bye. It seemed like that was all we were doing, just saying good bye. In January, Stacie and Amy joined us. Heather, Rusty and I plunged ourselves into the important training that goes on here. It became clear quickly, that our new replacements were sent from heaven. They were attentive and caught on to our culture as if they had been here forever. Stacie’s boyfriend, Andrew, is a Marine stationed in Iraq. She gives us reports from him and we pray for him to stay safe until he returns in October. She is studying to be a pediatric nurse. We are proud of her. Stacie grew up in Carson City, but it wasn’t until she worked at Southgate Coins that she learned about the significance of Carson City coins. In elementary school, the children went on field trips to the Nevada State Museum, which is the old Carson City Mint. Little mention was made of the coins on those trips; instead focus was mostly given to exhibits and the mine tour. I hope the future generations of Nevadans will be taught about the extraordinary treasure that is in their backyard. Few cities can boast that they have a true U.S. Mint of their own, especially a mint with our rich history. Amy is an education major, with aspirations to become a principal. She became part of our family immediately. Amy helps Rusty with his work on the new book. As she types the book, she gets excited and wants to know what is coming up in the next chapter. She also helped so much in the preparation of the upcoming Curry’s Chronicle due out at the end of June. She helped Rusty turn the images and word documents into the delightful magazine for all those happy Carson City Coin Collectors of America members, or C4OA members, as we like to call them. Amy had to go home for the summer, but she has promised to be back in August, so fortunately we didn’t have to say a real good bye. Just before Amy had to leave, Kelsey joined us. Reno is Kelsey’s home and she was returning from college in Southern California. She is sociology major at UNR. When Kelsey came on board we couldn’t believe our luck. She is also a perfect fit for our family. Kelsey got a crash course on how to work on the new book. Amy tried to write her all the instructions. She has been doing very well with the book and she’s already learned a lot about the different kinds of coins, terms for bullion and the many coin supplies we carry in the store for collectors. Thankfully we still have Heather, who is now going on her third year with us. Heather is responsible for managing coin images and inventory on the website. She also supervises shipments, trains new girls and is involved in all of the regular store operations. Along with her studies in college, she won a major role in one of our local area theatre plays. The play is a murder mystery and sounds like it is going to be a lot of fun. We are looking forward to seeing it. Heather is a talented young woman and I’m glad she is being recognized for it. How grateful we are to have this group of girls. Not only do they assist us with the daily duties of running a coin store, but they share all the adventures, stories and pure fun that coins and their history can bring. 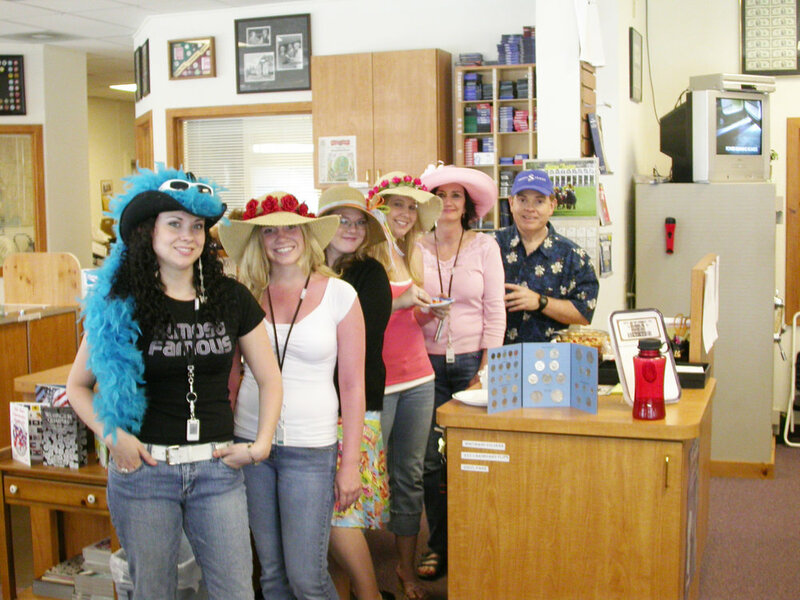 Of course, all of you old friends out there know there is no shortage of dinners, birthdays and annual celebrations (I have included a picture of us decked out in our Kentucky Derby hats too. We loved the Derby and cried on the Preakness). Around the corner of our sad good byes to old friends, came the gift of wonderful new ones. Another season with new beginnings. It’s going to be a great summer. Thanks to all of you out there for being a part of it.